Sanremo – Just a short distance from Monaco and the French Riviera, the city known as the “City of Flowers” offers long stretches of deserted white sands and calm waters, ideal for snorkelling, kayaking, and windsurfing. The perimeter of the city has a Riviera-style grandeur casino built on it, but deeper inside Sanremo you’ll find a more quaint and traditional old town. Known for La Pigna, the town’s hillside medieval section, and for hosting the oldest running music festival in Europe, Sanremo offers ancient scenery and dramatic, soaring cliffs. Enjoy an authentic pasta dish and a glass of wine on deck, and then take in the exquisite sunset reflecting on the crystal clear Mediterranean sea. Or, catch your own fish for dinner, and enjoy how your chef prepares it using some of the area’s finest extra virgin olive oil. 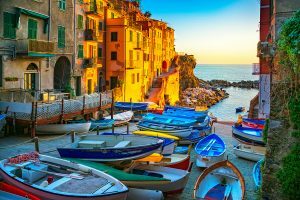 Imperia – A gorgeous coastal city nestled in the Italian Ligurian Riviera, Imperia straddles the River Impero and is an ideal stop during your Italian yacht charter excursion. When you approach Imperia from the west, it opens up to a breathtaking vista. Bright orange buildings decorate the hills, and the turquoise blue water is simply amazing. The area is well known for olive groves and beautiful flowers grown in greenhouses, so be sure to do some market shopping. Loano – A traditional yet whimsical town, Loano is home to white beaches and clear waters full of octopus, squid, eels, and occasionally also some dolphins in the autumn. Full of quaint streets with shops and traditional restaurants that preserve the regional cuisine, Loano is perfect for those who love a slow-moving lifestyle. Go snorkeling in the crystal-clear sea, and relax under a palm tree on a deserted beach. Or, indulge in a romantic dinner on deck, followed by a delicious local dessert of fig crostatas and fine espresso. 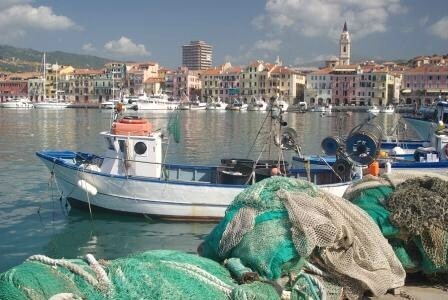 Varazze & Lavagna – Varazze boasts beautiful beaches and a lively town center. Be sure to visit the seventeenth-century Carmelite monastery outside of the town. Lavagna is a charming fishing town with small, quiet streets, historical spots and charming shops, along with several seaside beach resorts. Camogli – A beautiful little fishing village, Camogli boasts a rich sea bed and gorgeous sandy beaches. 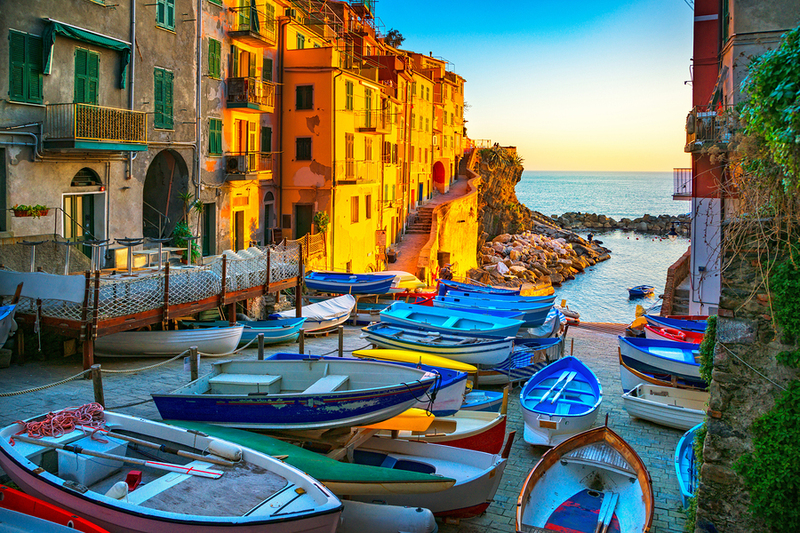 Quaint rustic houses overlook the sea, and the port offers beautiful views along with many little shops that sell pizzata and cheese to visitors. Be sure to stop and have dinner at one of the cafes serving delicious, authentic Ligurian cuisine—lasagna, fish soup, and pansotti pasta topped with walnut sauce are some of the local specialities. Portofino – Hidden and nearly inaccessible, Portofino is an ancient fishing village that remains an international symbol of the Italian Riviera style. 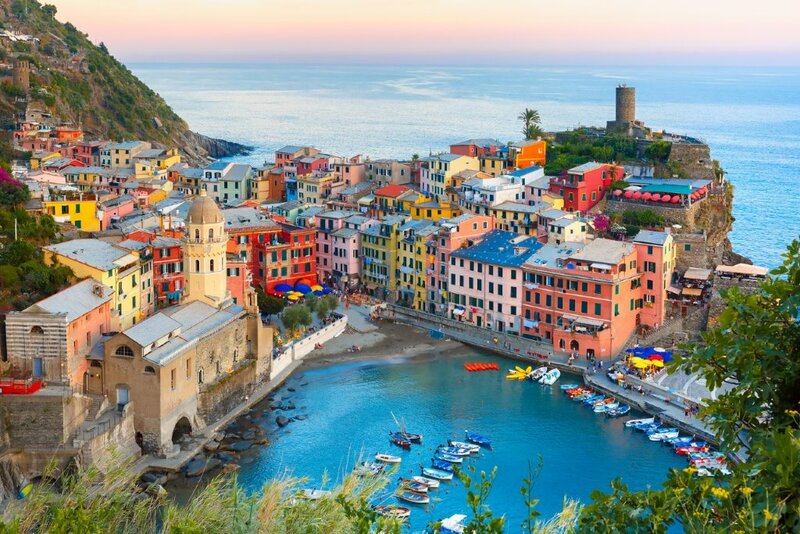 The stunning beauty of this brightly painted, vibrant town has made it the world’s most photographed port. Along the hilly coast, the magnificent villas of the rich and famous are visible, as well as views to the rocky shores. Explore underwater, where the protected reef offers red coral reefs, steep cliffs, and ancient shipwrecks. After you’ve built up an appetite, enjoy some authentic pizza and a cocktail from your private yacht, then bask in the Mediterranean sun on deck. Stop in nearby Santa Margherita and visit for a day, sampling some of the region’s finest Pinot Grigios. 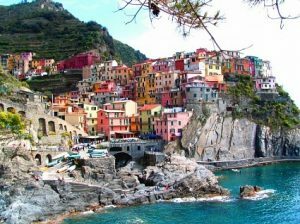 Cinque Terre – This portion of the Italian coast features five stunning villages perched on high cliff-tops on five fingers of land, overlooking the Ligurian Sea. These cities are famous for their vineyards, local wines, and famed hiking trails. Colorful houses cling to steep terraces, and trattorias along the harbors create some amazing seafood and pesto dishes. Uniquely, these five villages are locked in time due to the difficulty of reaching them. Locals hike back and forth on little goat paths, but the best way to see these villages is by private yacht, heading ashore by ship’s tender. Enjoy the dramatic scenery, laid-back feel, and warm wind on your skin, along with a glass of grappa on the top deck of your luxury yacht charter in Italy. 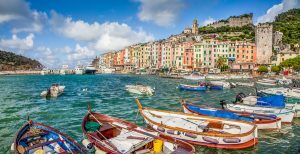 Portovenere – A lovely, small Italian town to stop and stay overnight, Portovenere is a re-emerging chic location, once extremely popular in the 1800s. The area is famous for its Bay of Poets, and the first thing you see when you enter is the magnificent Church of St. Peter. As you approach the harbor, you’ll marvel at the beautiful view of the coastline culminating in the magical Doria Castle. Portovenere has much to offer along its historic coastline, including incredible diving spots, an archipelago of islands and pristine beaches, and even its own inland national park. 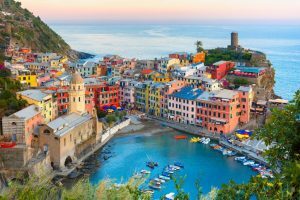 Chartering a luxury yacht in Italy, for an Italy yacht charter no matter the destination, offers a fantastic mix of romance, historical delights, and laid-back charm. Northrop-Johnson Luxury Yacht Charters provides perfect yacht charter itineraries and the highest standard of service on your own floating bit of paradise. Our private crewed luxury yacht charters are catered to meet your ideal and unique vacation experience. Let’s plan your dream vacation today.